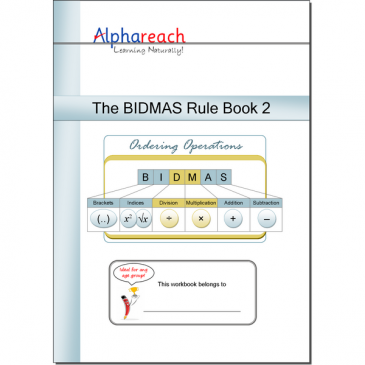 BIDMAS – When pupils work with numbers with more than two different operands or algebraic expressions it is very important that they learn and follow the BIDMAS or BODMAS rule. The consequences of ignoring this fact leads to an incorrect answer. Product Category: BDMS1 Pages: 32 | Size A4 Suitable for: Key Stage 3/4 – ages 11 to 16 ISBN: 978-1-912585-72-4 Expected delivery time: 3 to 4 weeks. Product Code: BDMS2 Pages: 32 | Size A4 Suitable for: Key Stage 3/4 – ages 11 to 16 ISBN: 978-1-912585-73-1 Expected delivery time: 3 to 4 weeks. Product Category: BUDBDMS1 Each workbook is Pages: 32 | Size: A4 Suitable for: Key Stage 3/4 – ages 11 to 16 Expected delivery time: 3 to 4 weeks.